Visit our SBC6120 Builder's Resources Page! 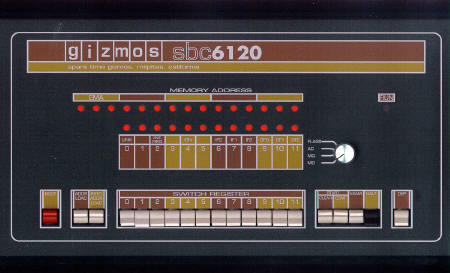 The SBC6120 Model 2 is a conventional single board computer with the typical complement of EPROM, RAM, a RS232 serial port, an IDE disk interface, and an optional non-volatile RAM disk memory card. 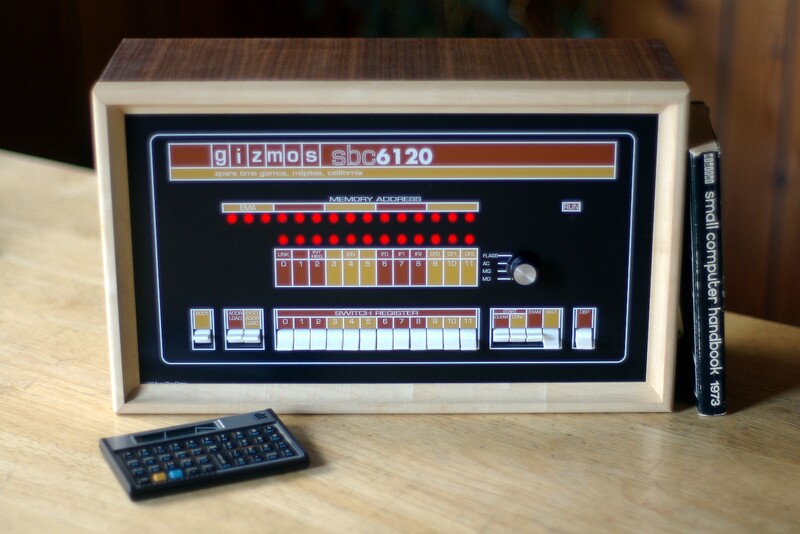 What makes it unique is that the CPU is the Harris HD-6120 PDP-8 on a chip. The 6120 is the second generation of single chip PDP-8 compatible microprocessors and was used in Digital's DECmate-I, II, III and III+ "personal" computers. The SBC6120 can run all standard DEC paper tape software, such as FOCAL-69, with no changes. Simply use the ROM firmware on the SBC6120 to download FOCAL69.BIN from a PC connected to the console port (or use a real ASR-33 and read the real FOCAL-69 paper tape, if you’re so inclined! ), start at 2008, and you’re running. OS/278, OS/78 and, yes - OS/8 V3D or V3S - can all be booted on the SBC6120 using either RAM disk or IDE disk as mass storage devices. Since the console interface in the SBC6120 is KL8E compatible and does not use a HD-6121, there is no particular need to use OS/278 and real OS/8 V3D runs perfectly well. The SBC6120 measures just 4.2 inches by 6.2 inches, or roughly the same size and shape as a standard 3½" disk drive. A four layer PC board with internal power planes was needed to fit all the parts in this space. A complete SBC6120 requires just 175mA at 5V to operate, and this requirement can easily be cut in half by omitting the LED POST code display. Imagine - you can have an entire PDP-8, running OS/8 from a RAM disk, that’s the size of a paperback book and runs on less than half a watt! 64K twelve bit words of RAM - 32KW for panel memory and 32KW for conventional memory. 32KW of EPROM which contains the BTS6120 firmware. 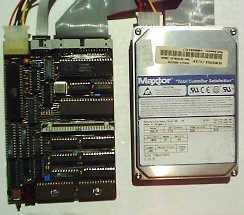 An optional RAM disk card containing up to 2Mb of eight bit of battery backed up, non-volatile SRAM. A memory management system that controls the mapping of RAM, EPROM and RAM disk into the panel memory space. A real, straight-8 compatible console terminal interface. The logic for this interface is implemented in a GAL - no 6121 is used and no software emulation is required. A four LED display used to show POST error codes. A power on self test (POST) of the SBC6120 hardware, including the CPU, a memory test for EPROM, RAM and RAM disk, and a test of all peripheral devices. Commands to examine and change main memory or panel memory, plus commands to clear memory, move memory blocks, compute checksums, perform word searches, etc. Commands to examine and modify all 6120 registers. The ability to set break points in main memory programs, and to execute single instructions and generate instruction traces. A BIN format loader for loading paper tape images through the console port. RAM disk I/O functions to assist the OS/8 VM01 handler. IDE disk I/O functions to assist the OS/8 ID01 handler. Commands to upload and download both RAM and IDE disk over the serial port. An OS/8 bootstrap for both RAM and IDE disk. As a historical note, the BTS6120 software started life in 1983 as a bootstrap program for an elaborate Intersil IM6100 system I had planned. The software was developed and tested on a 6100 emulator that I wrote to run on a DECsystem-10, but it never saw any actual hardware. Although I built several simpler 6100 based systems, the one intended for this software proved to be too complex and was never built. Never built, that is, until 1999 when I rescued some 6120 parts from a dead DECmate and decided that, with cheap SRAMs for mass storage and modern GALS instead of discrete TTL to build a console interface, it was time. 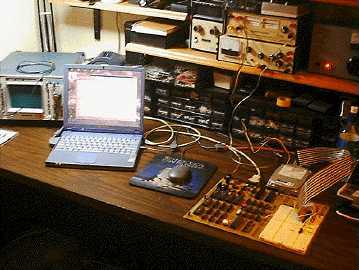 That, and about six weeks of work designing the hardware and laying out the PC board, and another two months or so of hacking the BTS6120 software to work in this new environment and the SBC6120 Model 1 first ran FOCAL-69 early in 2000. 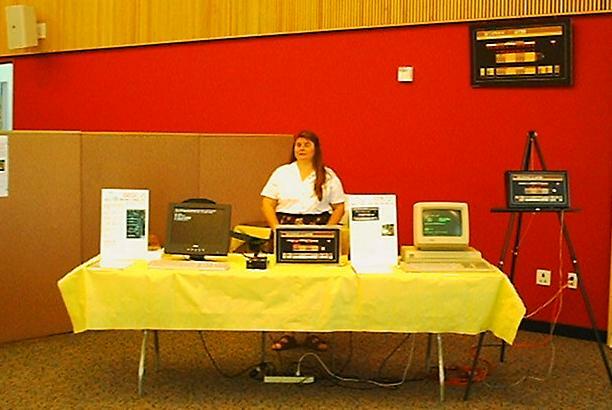 The Model 1 was a useful platform for writing the firmware and device handler to make OS/8 work with the RAM disk, and later for developing and testing the IDE interface and writing the software for that. The Model 1 was too big and clunky, however, and I wanted something that I could fit into a small cabinet along with a hard disk. That, and another few months of designing on weekends and in the evening, gave us the Model 2 that you are reading about now. All SBC6120 documentation files including the schematics and the SBC6120 User's Guide, are covered under the terms of the GNU Free Documentation License. Permission is granted to copy, distribute and/or modify these files under the terms of the GNU Free Documentation License, Version 1.1 published by the Free Software Foundation; with no invariant sections; with the front cover text "Portions Copyright (C) 2001-2003 by Spare Time Gizmos" and our URL, and with no back cover text. SPARE TIME GIZMOS OFFERS NO WARRANTY, EXPRESS OR IMPLIED, AS TO THE RELIABILITY OR ACCURACY OF THE SBC6120 DESIGN. SPARE TIME GIZMOS OFFERS NO WARRANTY, EXPRESS OR IMPLIED, AS TO THE SUITABILITY OR CORRECTNESS OF ANY SOFTWARE OR FIRMWARE SUPPLIED IN CONJUNCTION WITH THE SBC6120. SPARE TIME GIZMOS MAKES NO REPRESENTATIONS AS TO THE SUITABILITY OF THE SBC6120 FOR ANY APPLICATION. THE ENTIRE RISK AS TO THE USE AND PERFORMANCE OF THE SBC6120 IS ASSUMED SOLELY BY YOU. Update - December 5th, 2011. SBC6120 User's Manual, Design Files and Source Code FREE!